I did fairly well at the last tournament using Orcs, but I think I am going to try something new this time. I recently picked up a REALLY nicely painted Amazon team from an old friend, so I have decided to give them a try for Orclahoma Bowl. But Spiky Cup requires a different approach. Spiky Cup is all about the carnage, so the fragile Amazons just will not cut it. I have decided to give Dwarves a go for Spiky Cup. The only problem is that I do not currently have a painted Dwarf team. I just picked up a very poorly painted team from someone, and have just finished stripping them. 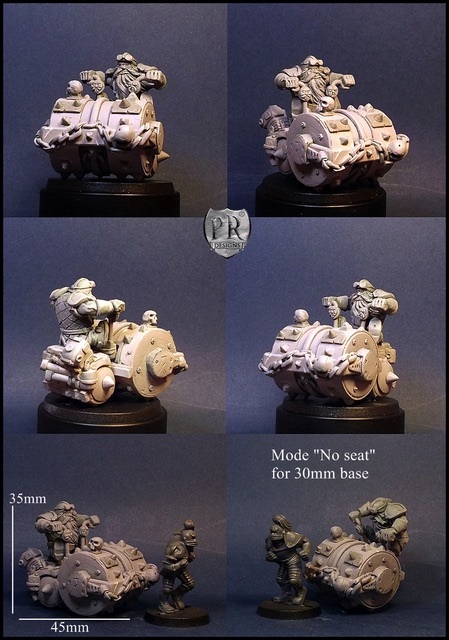 I also ordered a Deathroller from Vortice Miniatures, which looks fantastic, and was very reasonably priced including the international shipping. Now comes the hard part… I have to paint an entire team in the next month. That is not an impossible feat, but it definitely might be challenging. I often suffer from real motivation problems when it comes to painting minis. I officially started painting tonight, and got a little bit done. The plan is to paint a little at a time so that I do not lose motivation, and so I do not end up trying to do it all at once the week before the tourney. Hopefully, if I post about it, I can keep my motivation up and actually finish the team in time for the tournament. I will try and post some pics as I get some minis completed. And, if anyone actually stumbles across this blog who is close to the Oklahoma area, check out Orclahoma Bowl. It should be lots of fun, and there will be tons of prizes!